It wasn’t a secret that the company was experiencing a major struggle in terms of keeping themselves on top of various tech battles (console, mobile, etc.). Sony has been reported to do major job cuts and cost reduction for a decade now, which soured the company’s innovative culture. As a solution, they build a creative division, to be headed by Chief Executive Officer Kazuo Hirai, to track down promising products such as the e-ink smartwatch. Electrophoretic Ink (E-ink) is a special type of electronic paper that is founded by Joseph Jacobson and Barrett Comiskey of E Ink Corporation in 1997 and patented in 1996. Commercially available in grayscale and colored, it is used today in the screen of e-readers as well as affordable mobile phones and smartwatches such as the Pebble. One of the greatest features of the e-ink screen is its ability to produce a clear display even in broad daylight, without using too much battery on the device. The first mobile phone to support the e-ink display is Motorola’s Motofone F3. How does the watch look like? Ever wonder if you can fully customize your smartwatch from the screen to its strap? Well, the rumored upcoming wearable device from Sony will have the ability to customize not only what you can see on the face of the watch, but also the way you want your strap to appear (classy leather-looking, full leather-looking, or the stainless steel-looking strap?). It will be made of completely by an e-ink and e-paper patented material in one piece. 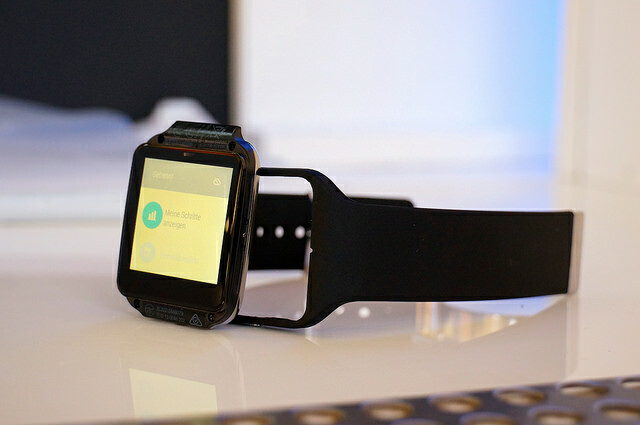 The sources said that it will focus more on style than competing with other smartwatches with powerful hardware. However, it looks similar to a Japanese crowdfunding project called the Fashion Entertainments Watch. Gizmodo reported that the project has raised enough backing and funds to make it into a reality, and to be available sometime in May 2015. Among the list of smartwatches today, it was the Pebble that massively introduced the e-ink technology to the market. Apart from that it was known to be the first smartwatch that can connect to iOS (iPhone 3GS to iPhone 4S with iOS 5 or iPod Touch with iOS 5) and Android devices (devices running OS 2.3 and above). The device took the technology world by storm, with $10.2 million fundings (pledged goal was at $100,000) and 68,929 backers. It is known to be the ‘ most funded Kickstarter project‘ for more than two years. Today, the Pebble Original is still on the market, even with the arrival of its successor the Pebble Steel. In the United Kingdom, O2 sells the Original for £99.99 ($157.98) and the latter for £179.99 ($284.38). The network company also offers Sony’s current smartwatches on the market such as the SmartWatch 2, the SmartWatch 3, and the SmartBand – the SmartBand Talk will also be available to their store soon. If Bloomberg’s sources are telling the truth, then we should be expecting the fifth Sony smartwatch on the shelves soon. Will it be Sony’s knight and shining armor? During Sony’s investor conference in May, Hirai was optimistic to discuss that about this new smartwatch project, saying that it will be “the driving force for our new Sony” by nurturing young talent to do the task. However, one source of Bloomberg (a Sony engineer) disagrees with this idea, stating that younger employees are actually hesitant in trying this new project as there’s too much room for success but also lots of rooms for failure. Although Sony officials haven’t confirmed or deny anything at this point, what we can only do is wait until the company can finalize the specifications of this much-awaited device. From there, we can evaluate whether this new smartwatch contender will be able to defeat other smartwatches and help the company get back on its feet.